The Patrick McCurdy Education Foundation (PMEF) was formed in 2004 after the tragic death of PHHS school counselor, Patrick McCurdy, and his daughter, Olivia.The Foundation, which was formed under the guidance of Patrick’s widow and PHHS teacher, Katie Barr-McCurdy, initiatedseveral programs to serve students in the Pleasant Hill School District.These included support for the PHHS Child Development program, Reaching Out Mentoring (ROMP), scholarships for qualified PHHS graduates, and the Lunch Buddies program. 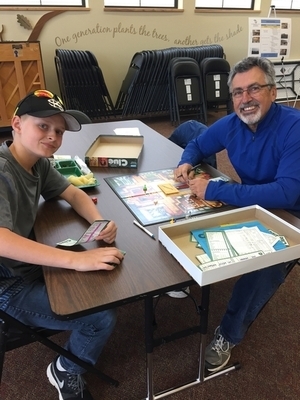 The Reaching Out Mentoring Program, which has provided one-to-one mentoring services to identified middle school students working with a trained adult mentor, as well as programs providing secondary school mentors for younger students is still going strong.In fact, as of July 2016, the Pleasant Hill School District has provided the funding for a part-time positionto support the ROMP Program Director.The current director, Lorena Hammond-Mendez, has expanded the program and provides training and positive leadership to support student success from kindergarten through high school graduation. After several meetings, the Boards of Directors of the Patrick McCurdy Education Foundation and the Pleasant Hill Education Foundation have joined forces to continue to support this important work.The McCurdy Foundation is now the Patrick McCurdy Education Fund under the auspices of the Pleasant Hill Education Foundation.All remaining assets of PMEF have been moved to PHEF to support the McCurdy Fund.Specifically, we hope to continue to raise funds to provide for the ROMP program, specifically for student activities, field trips, and equipment. We are currently recruiting adult mentors for the 2018-19 school year. Those who are interested in making a tax-deductible donation to support ROMP can donate below or send a check to PHEF, PO Box 636, Pleasant Hill, OR 97455.